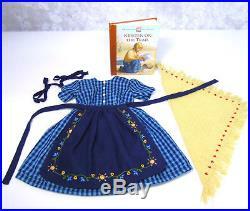 Vintage American Girl Pleasant Company Doll Clothes KIRSTEN CHECKED DRESS And APRON - Also Known As Kirsten's On The Trail Outfit - Was Introduced To Kirsten's Collection In 1999 and Retired In 2007. The Outfit Is Associated With The Short Story Book Kirsten On The Trail. The Checked Dress & Apron - Kirsten On The Trail Out Is Complete With Pleasant Company Tag Checkered Dress & Apron. Shawl, Hair Ties, Book & Hanger! Dress: Light & Dark Blue Long Gingham Dress With White Buttons On The Front. Shawl: Yellow Shawl With Fringe And Red Embriodery. Apron: Dark Blue Apron With Flowers Embroidered Around The Edges. 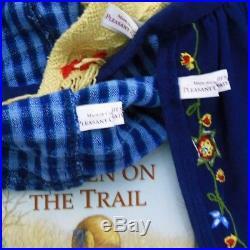 2 Hair Ties: Kirsten's Dark Blue Hair Ribbon Ties For Trail And School Outfits. Kirsten On The Trail Book. Excellent Condition With Pleasant Company Tags. Size: Fits All 18 American Girl Dolls. Great Birthday Gift for Her - or For Yourself! THANK YOU for shopping at You Found It 1111! 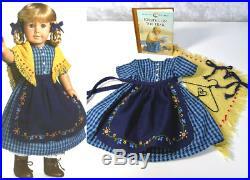 The item "American Girl KIRSTEN CHECKED TRAIL DRESS APRON OUTFIT Pleasant Company Clothes" is in sale since Friday, July 20, 2018. This item is in the category "Dolls & Bears\Dolls\By Brand, Company, Character\American Girl\Kirsten". The seller is "knoxjk11" and is located in Danville, Indiana. This item can be shipped worldwide.